HomeTravelWalk Past Those Limp Salads: Real Food Is Now Available by Gate 6. Walk Past Those Limp Salads: Real Food Is Now Available by Gate 6. March 2, 2019 Travel Comments Off on Walk Past Those Limp Salads: Real Food Is Now Available by Gate 6. Airport food has long conjured images of limp, overpriced Caesar salads and refrigerator-case turkey wraps. But as terminals across the country modernize, and the demand for local food grows, the number of destination-worthy airport outposts offering food you’ll want to eat has been steadily growing. The most recent example opened in January. The Manufactory Food Hall at San Francisco International Airport now offers fast-casual representations of cuisine from four notable local chefs and bakers: Pim Techamuanvivit of Thai restaurant Kin Khao, Gabriela Camara of Cala, and Elisabeth Prueitt and Chad Robertson of Tartine Bakery. 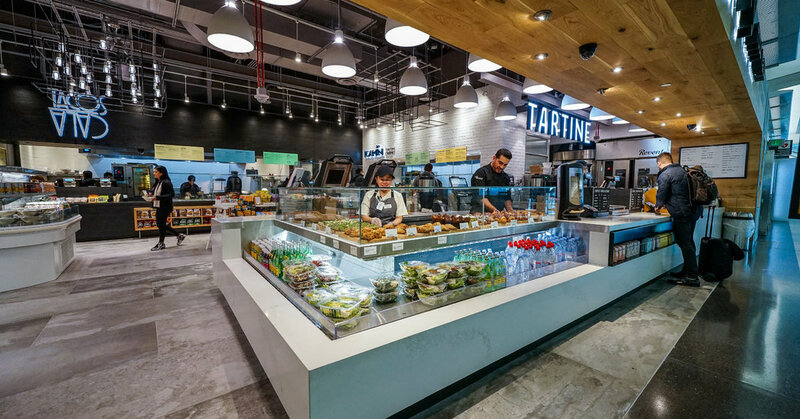 Instead of soggy french fries and overcooked burgers, travelers in the International Terminal can order sandwiches on Tartine bread, gluten-free Thai fried chicken boxes and curry soups, and Mexico City-style tacos. The hall also features freshly baked pastries, Tartine’s coffee and a full bar. Opening a restaurant anywhere is difficult. Opening in the airport is a whole new level of hard: Unfamiliar security systems and supply chains, concern over operational control and the fear of brand misrepresentation are just the immediate hurdles. But the potential for such exposure — from a captive and hungry audience, no less — along with a new willingness of airport food service operators to meet chefs’ demands has made the prospect more appealing. For Ms. Prueitt, the chance to work with other local chefs made the proposition realistic and exciting. All of the chefs operate out of Tartine’s San Francisco commissary kitchen, butchering, slow-roasting and fermenting their goods before delivering them to the airport. Ms. Prueitt makes weekly visits to catch up with staff and personally taste everything. When Rick Bayless opened Tortas Frontera in Chicago’s O’Hare International Airport in 2011, it meant giving up a good amount of control. The vast majority of airport restaurants domestically are run by third-party operators and staffed by their employees; the Manufactory is run by SSP, while Tortas Frontera’s three O’Hare locations are under the purview HMSHost. For chefs, that means a different kind of oversight is required. That commitment, and willingness to work with airport-specific challenges, is necessary. Employees require security badges to get to work. Deliveries follow a tight schedule; chefs can’t decide, on a whim, that they’d like a certain product. However, operators have become more agile to chef demands (Mr. Bayless, for example, wanted to use ingredients from his favorite purveyors), and have built up their own infrastructures as this demand and interest has grown. HMSHost established a partnership with the James Beard Foundation and has built out its own chef staff, said Stephanie Havard, executive vice president of restaurant development. The new food destinations in San Francisco and Chicago are far from alone. A Denver favorite, Root Down, opened a location at Denver International Airport in 2013; an outpost of the Denver Central Market opened there last November. Minneapolis–Saint Paul has locations of Black Sheep Pizza, Salty Tart and Angel Food Bakery. Phoenix, along with Seattle-Tacoma and New Orleans, have terminal modernization projects underway, with new local food options planned. Portland International Airport, in addition to hosting locations of Blue Star Donuts, Kenny and Zuke’s, and The Country Cat, also provides travelers a tasting room for a local distillery, Westward Whiskey, which sells tasting flights and cocktails alongside bottles for sale. And some food-minded travelers will adjust their itineraries for the sake of visiting a certain restaurant. April Oed Hamilton, a food educator and writer based in Baton Rouge, La., says she flies into San Francisco, instead of the more convenient San Jose Airport, when visiting a sister who lives in Santa Cruz. “Anything for that Tartine morning bun!” she said. In fact, Mr. Bayless says that Tortas Frontera at O’Hare has more regular customers than his downtown restaurants.